The cost of the instruments needed to run a hospital or a lab is often exorbitant—but what if doctors and scientists could simply print their own tools from an open library of designs? That's what a paper published today suggests. What if a scientist could simply go to an open-source library of tools, select the one he or she needed, and print it out within a few hours? 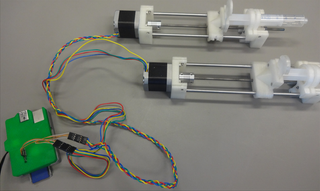 It's not all that far off, as the Michigan Tech researchers behind a paper called Open-Source Syringe Pump Library, published today in PLOS One, explain. That way, you can link the syringe pump to the network, sit on a beach in Hawaii and control your lab. Plenty of people can have access, and you can run multiple experiments at the same time. Our entire single-pump system costs only $50 and can replace pumps that run between $250 and $2,500. Remote-control labs are great, but what's really important about the idea is how little it costs. 3D printing has already driven down costs within medicine, say the authors of the paper, from reducing the price of "neural circuit reconstruction" to applications within nanotechnology. But that's just the beginning. "Even greater cost reductions for science, however, can be found with the application of open-source hardware," the authors argue. "The development of open-source hardware has the potential to radically reduce the cost of performing experimental science and put high-quality scientific tools in the hands of everyone from the most prestigious labs to rural clinics in the developing world."